Once again, I am in 2 online quilting bees in 2018. The first is Stash Bee, where I am queen in my hive for January. This means no blocks for me to make and I've been getting fabulous bookshelf blocks in the mail all month! In Bee Inspired, Sharon was Queen in January. 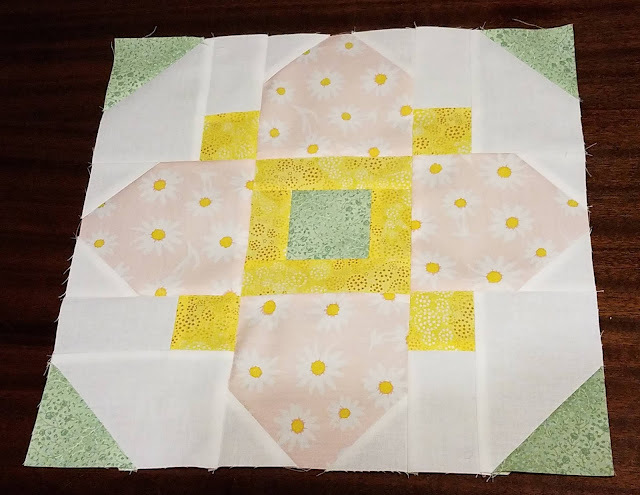 She asked for Quatrefoil blocks with pink, green, yellow, blue, turquoise, and coral. We could choose which colors went where. This is my second time making a Quatrefoil block and I really like it. The pink fabric was one of the fabrics I bought with a Christmas gift certificate from my mom and I love how it looks in this block. This was not for a bee, but I did make 3 Perkiomen Valley blocks to go into quilts for those displaced by the Thomas Fire in California. Carole of From My Carolina Home put out a call for blocks and volunteered to assemble 3 quilts. I sent mine to her, though she is now asking that additional blocks be sent directly to the Ventura Modern Quilt Guild. It's a great block for scraps! Very pretty quatrefoil block Emily and those Perkiomen blocks look good. It's a very effective block pattern. The quaterfoil block turned out beautifully. Your Perkiomen blocks look great too.